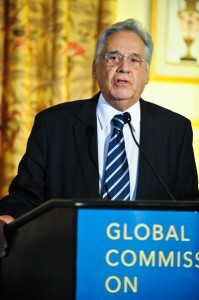 Former President of Brazil (1995-2002) and former Chair of the Global Commission on Drug Policy (2011- May 2016), Fernando Henrique Cardoso is currently president of the Instituto Fernando Henrique Cardoso (São Paulo, Brazil) and honorary president of the Party of the Brazilian Social Democracy (PSDB). Co-president of the Latin American Commission on Drugs and Democracy (since 2008), leading member of the Global Commission on Drug Policy (since 2010). He served as president of the Independent Commission on Aids and the Law, and is a member of the council of Global Leaders for Reproductive Health (since 2010). He is also member of the Board of Directors of the Club of Madrid (Madrid) and, in the United States, he is member of the Clinton Global Initiative (New York, NY); member of the Board of Directors of the Inter-American Dialogue, the World Resources Institute and a member of the Board of Overseers of the Watson Institute for International Studies of the Brown University (Providence, RI). He was born on June 18, 1931, in Rio de Janeiro, married the anthropologist Ruth Cardoso (1930-2008) and has three children. A sociologist trained at the University of São Paulo, he emerged since the late 1960s as one of the most influential intellectuals in Latin America. Cardoso was deeply involved in Brazil’s struggle for democracy to overcome the authoritarian military regime (1964-1985). Elected Senator in 1982, he was a founding member of the Party of the Social Democracy (PSDB). He served as Minister of Foreign Relations in 1992/93 and Minister of Finance in 1993/94. Berkeley), of Cambridge (United Kingdom), of Paris-Nanterre, as well as at the École des Hautes Études en Sciences Sociales and the Collège de France. He has earned more than 20 Honoris Causa degrees from some of the most famous universities. Foreign Honorary Member of the American Academy of Arts and Sciences. He was awarded honours such as the “Prince of Asturias Award of International Cooperation 2000”, the UNDP’s 2002 inaugural “Mahbub ul Haq Award for Outstanding Contribution to Human Development” and the “J. William Fullbright Prize for International Understanding” (2003). His main works in English include The Accidental President of Brazil (2006, with B. Winter), Charting a New Course: The Politics of Globalization and Social Tansformation (2001, M.Font editor) and Dependency and Development in Latin America (with E. Faletto, 1979).